Dubai, March 25, 2018: His Highness Sheikh Hamdan bin Mohammed bin Rashid Al Maktoum, Crown Prince of Dubai, witnessed the season finale by attending the 11th Saluki Championship finals today, Sunday 25th of March. 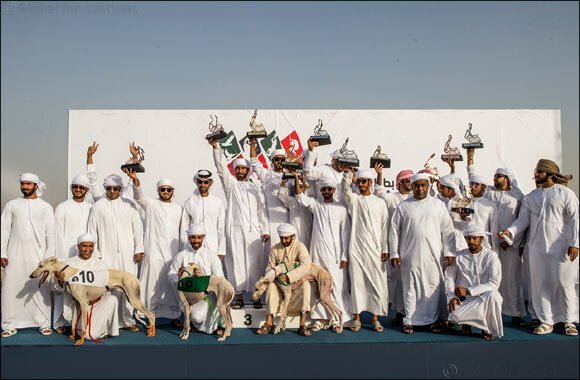 The Saluki Championship organised by Hamdan bin Mohammed Heritage Centre (HHC) was held in Al Marmoum (Circle 11) in Dubai. His Highness Sheikh Hamdan, watched the six rounds of the race in both the 1,000-metre and 2,500-metre races for male and female salukis. The championship was also attended by Sheikh Al-Murr Al Maktoum and HE Abdullah Hamdan Bin Dalmook, Chief Executive Officer of HHC. Rashid bin Markhan, Deputy CEO of HHC; Mohammed Abdullah bin Dalmook, Director of Corporate Support at HHC; and Jumaa Al Muhairi, Chairman of the Salaki Championship Committee, awarded the trophies to the winners. The official sponsors of Hamdan Bin Mohammed Heritage Center are: Al Tayer Motors Land Rover, Dubai Airports, AW Rostamani (Arabian Automobiles), Global Village and Al Oula radio station.